Everything ends. The sun sets on everything. My adventures in Chile have come to an end. A five month excursion turned into an eight month one. I lost all perception of time. Days and weeks and months folded in on themselves. There was light and dark. There were days when people were at the marine station, and days when they were not. There was sun and clouds and wind and stillness. There were days of diving and months without it. There was research and then there was painting. Eight months came and went, moving both slowly and all too quickly. I’m a bit dumbfounded at how all of that time passed without me truly realizing that it had actually happened. I almost feel like it didn’t. It feels like it was some elaborate dream I was hazily trying to salvage some details from after being abruptly awakened at three in the morning. It was different coming home. The palta wasn’t the same. Neither was the olive oil. I nearly cried when I saw the immense amount of single-use plastics. Coming home was hard because I had changed so drastically. I missed my Chilean family. I missed the sea. I missed the animals I had come to adore so intimately. I have not been as depressed or heartbroken as I thought I would be, but it is still early on. There is still time. Everything ends. Time continues moving on, with or without you. I have had to accept that my life in Chile is gone, at least for now. It was time for me to come home. Beyond time. I have to face the things I was running from. I have to find that next part in my life. Those eight months in Chile deeply impacted me, more than any other trip previously. It breathed life into me, and it took it away from me. I was enlightened and strengthened as well as strained and stretched. As with every previous trip to Chile, I learned a great deal that I would like to share with you in the hopes that it may help you. I am generally a patient person. I will wait for a long time. I will work arduously for something that is very far down the line. I can sobrevivir and push through something for as long as it takes because I keep the end goal at the forefront of my mind. For twelve years of my life, I have been working towards becoming a marine biologist. But, that meant a lot of waiting. Not idle waiting, but working furiously towards my goals while waiting for my time to arrive. I waited years to do my first ocean dive. Waiting for that dive was so hard. I remember becoming so frustrated in 2011 because I so desperately wanted to dive but did not have the capacity to do so. I waited for years to finally do research or something related to my field of interest. That end goal of doing the very thing I had been working so hard towards accomplishing was so vivid in my mind, and I was willing to do whatever it took to get there. When I came to Chile this time, I thought that I would finally have that opportunity. I was convinced that all of my waiting would come to an end. I was certain that my dedication to my work in high school, university, and at the marine station would allow me to finally start doing what I so deeply wanted to do. Just because you have a burning desire to do something does not mean that it will come to you easily or in the amount of time that you would like. I found myself at square one, watching everyone else do the thing I had been slaving away to do. Meanwhile, I was told to sit back and watch. I cannot explain to you sufficiently the agony of watching other people do the thing that you so desperately want to do while you are told to stay on the sidelines and watch it happen. That desire to work in my field was a fire eating me alive. Instead of the fire being put out, however, more gasoline was being thrown on it. The string was dangling in front of me and I couldn’t quite reach it. For a long time, I was deeply frustrated. Had I not worked hard enough? Would I ever get to do the thing I loved? Was I not good enough? A dear friend said something to me that took a long time for me to process and accept. As we were walking away from the jagged lava rock coast of Rapa Nui, he gently said to me, “Maybe it’s not time for you to do science right now. Maybe you need to just enjoy other things.” At first, I wasn’t in a place to accept that. I flipped the sea urchin shell over in my hand as I mulled over his words. How was it not my time now after everything I had done? If it wasn’t my time now, when would my time be? Would it ever come? I fought so hard against that concept. This had to be my time, I'd sunk too much energy, funding, and time itself into this for it to “not be my time.” It wasn’t fair. It wasn’t right. But time doesn’t have any concept of fairness, justice, or how hard you worked. It simply exists. I fought so hard for so long because I was sure this had to be my time and that everything else was just wrong. I had worked too hard to lay down and die. Sometimes, though, you can’t fight it. Your time will come when it is time. It may be five weeks from now, it may be five years from now, but one day, everything I have done will be worth all of the work, and it will be worth the wait. Somewhere along the line, my happiness had fled South for the winter and didn’t have plans on returning. This had happened long before Chile, but I didn’t realize it until I was there. I didn’t have much time to process anything during university. However, alone at the research station hunched over a dissecting scope and sea urchins, I had too much time to think. Far too much. I had to process too many things. I had to go through a lot. I had to take a hard look at my life and figure out where I was. I had to acknowledge some hard truths. I wasn’t completely unhappy. I had certain periods where I was absolutely elated. However, these tended to be fleeting moments and my general state of being was either neutral or sometimes simply unhappy. I had been happy in Chile before. I had been happier than I ever had before. But as a few months went on and as I had time to process, the superficial happiness faded and I realized where I was. I vowed to change myself and find the happiness I had lost. Someone recently proposed the question, “Is there anything that you do that you enjoy?” Unfortunately, it took awhile for me to respond to that. When your hobbies also happen to be your work, sometimes they can become draining. Painting was originally a stress reliever for me. After making an entire book of drawings and paintings, I was so exhausted that I couldn’t bare to think of painting anything else for awhile. I still love painting, I just need a break. But, that meant I had few things left to enjoy to keep me occupied and regain my happiness. I thought for awhile about times when I was truly happy. There was one in particular that stood out to me. In Rapa Nui, a few days before I was supposed to leave, I took matters into my own hands and tore off into the sea for myself. I had to know the animals I had painted and come to know intimately. I had to see them for myself. Snorkeling in the shallow emerald waters by the pier, I was embraced by a world I had only dreamed of for all of my life. 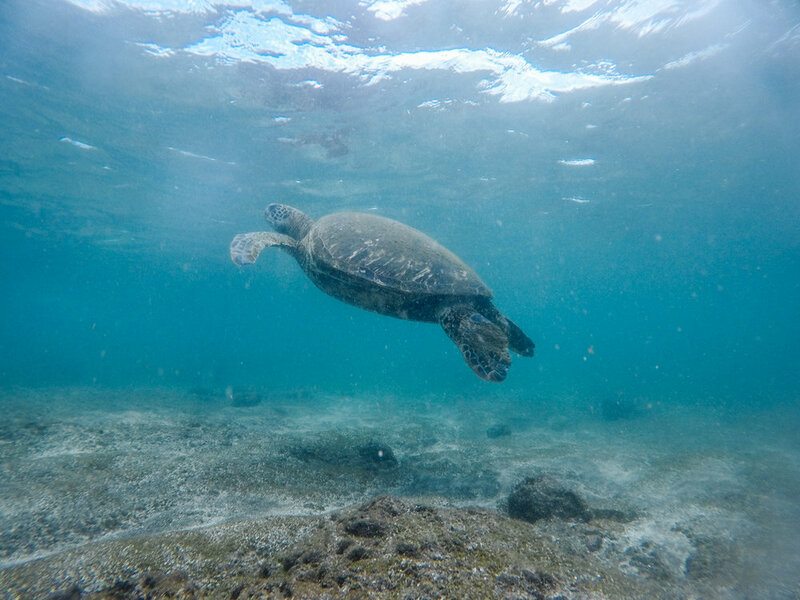 Fish flashed in large schools around me and sea turtles in all their majesty floated gently beside me. I was in awe. I was beside myself. For two days I snorkeled for as long as I could before I was too cold to continue. I had never in all my life been that happy. With only myself and the marine life, I found myself again. I remembered why I had fought so long to be a marine biologist. I remembered what it was like to be purely, unashamedly happy. I have never been that happy in my life. I know what that feels like now. I know what work should feel like. I know what true happiness feels like. I have to find that again. Happiness is important, and it is worth the struggle. Like 99% of other humans on this planet, I struggle with self-esteem and self-worth. I am doing better than I was, but I have a long way to go. It’s so easy to get wrapped up in our self-worth in today’s society. You feel like you have to be the perfect worker, the perfect friend, and the perfect lover, or you won’t amount to anything. It is easy to lose yourself in worrying about what others think of you. In my first few trips to the station, I felt my self-esteem and self-worth skyrocket. Every time I returned home to my university and showed that I was leagues above my peers in terms of experience, I felt proud of myself. I felt like I had accomplished so much. I returned to Chile on that same high. That high crashed within a few months. And by crashed I mean it crashed as if a Boeing 767 crash landed nose-first into the ground from an altitude of 35,000 feet. You cannot base your self worth on how others value your work and you as a person. It’s dangerous. It’s toxic. And of course, that is so much easier said than done. When you work as hard as I did to get to Chile and then worked as hard as I did to stay in Chile, and then worked to complete more tasks than a sane human would take on, it’s hard not to get your worth mixed up in your work. It hurts deeply when all of the work you have put your heart and soul into is not acknowledged. It is terribly difficult when after everything you have done, you are still pushed aside and your work largely ignored until it serves someone else. It is terribly upsetting for your work to be exploited. “Why me?” was a constant question. Why, after everything I had done, was I being treated this way? Why was I the person who always had to sit back and watch everyone else do the things I had fought so hard to do when I had worked so hard to get those opportunities? I wrestled with my self worth. I wrestled with whether or not I was valuable or any good. Did any of my hard work matter? Did any of the sometimes 15+ hour work days that I was doing not mean anything at all? Was the work I was doing not good enough? Was I not good enough? We humans have different strategies for saying whether or not we think something is valuable. Money, time, energy, and acknowledgement are all ways that we show that we find that something is valuable. But when you are not receiving those “signs” that we have been trained to associate with value, we think that we ourselves are not valuable. Your personal value cannot come from outside of you. It cannot be determined by how much someone acknowledges your work, how much money they pay you, or the opportunities that they grant you. If you are constantly seeking your personal worth from outside sources, you will never find peace. One person may deeply value your work while the other disregards it completely. Just because someone disregards your work does not mean it is not important. Just because they disregard you does not mean you are not valuable or worthy of good things. You have to acknowledge your worth for you and for no one else. I felt like I was only valuable enough to guard the fieldwork truck and equipment, glue blocks together, and paint fish. I felt like that for a long time. Part of it was because I was neglecting to see the other things I was doing. Part of it was because I was allowing other people’s perceptions of me (or the perceptions that I perceived them to have) to become my own perception, and that was not healthy or helpful. I am a scientist. I am a diver. I am an artist. I am a photographer, a filmmaker, an avid ethologist and ichthyologist, a mentor, a listener, a teammate, a leader, an organizer, a kind person, a friend. I am so many things. I am valuable. I am a part of this world, and I can do something to help it. If I base who I am on what others think of me or my perceived idea of what they think of me, I can’t accomplish all of the things I am capable of. I have to see the value of what I do before anyone else can. I have to sell it to myself before I can sell it to someone else. I am valuable. I am worthy of good things. And if someone doesn’t see that, that is on them. I will continue to move forward and show other people that they are valuable. I will continue to be valuable to this world. I will draw my own personal boundaries of what I will and will not do because my personal value is not in how many things I can do at once. I will continue to do things I feel are necessary and do what I believe in, regardless of what value others place on my work. Sometimes you need something outside of yourself to help get you out of your head. Sometimes you need to get lost in someone else’s story for just a little while. At the station, I was technologically isolated. Netflix and Spotify were blocked, so I basically had nothing. Thankfully there was YouTube, but movies weren’t a thing. I wouldn’t consider myself a big movie person. When I was home in the States I watched movies infrequently, not because I didn’t like them but because I didn’t have time. However, after months and months of nothing but work and isolation, I missed movies. I missed books. I missed the little distraction to keep your mind off things. And then we got on a plane to Rapa Nui and I had five hours between me and the island. And the plane had movies. A friend recommended Interstellar and so for three-ish hours I lost myself in someone else’s story. I didn’t think about my stress or worry, and it was wonderful. And then, someone gave me Blue Planet II. For an entire week, I lost myself in it. I had waited a long time to see it, and as I watched it I could barely pull myself away from it. I was reminded of why I do what I do. I was reinvigorated. It captivated me so deeply and gave me something to look forward to after the sun had departed and everyone had gone home to do their own things. I discovered the power of audiobooks and podcasts a little later. A few weeks before my departure, I was alone in the office for a full week. Normally I would be excited about a little space, but the realization that my time was short and the little pang of sadness that I couldn’t afford to go on vacation, too, made me a bit lonely. I needed some company. So, I decided to try a few audiobooks. These proved to be one of the best ideas I had. They pulled me out of my thoughts and into someone else’s. They gave me something to look forward to and someone to keep me company when I was feeling immensely lonely. I want to say a special thank you to John and Hank Green. Their books and podcasts helped me to think critically again, reminded me that I was smart, and reminded me that I was not alone. They helped me laugh, they helped me to see other perspectives, and they helped me to cope. When nightly thought spirals keep you awake or you feel like your thoughts are inescapable, the worst thing you can do is try to ward them off by simply laying there thinking, “STOP THINKING ABOUT THESE THINGS!” Little distractions can help get you out of your head for a bit and help you distance yourself from your thoughts. You certainly shouldn’t lean too heavily on these distractions, but they can be useful tools. It has never been easy for me to form close relationships. I never really learned how to do it, and the idea of it frightened me. Something about Chile changed all of that, though. Before I knew what was happening, I felt myself being pulled into other people’s gravitational field. Something was drawing me into them, something I could not ignore. I found myself feeling more comfortable being open. I found myself wanting to be around them more. I found myself wanting more. But I was also terrified. What if they did not like the “real me”? What if they got sick of me? What if they burned me? I was also keenly aware of the fact that I would not be here forever, and that the closer I became, the harder it would be when the time eventually came for me to leave. The human experience is far more similar than we believe it to be. Most humans are nervous that people will no longer like us when they get close enough to see us for everything we truly are: our strengths and our weaknesses. But, the experience of having that intimate, deep connection with someone is worth risking that. It is worth risking your vulnerabilities. Having beautiful, intimate moments with people is worth everything. Laughing with them is worth everything. Having inside jokes and nicknames is such a gratifying experience. I have never felt friendship so deeply. I have never felt so connected. I have never loved so deeply. Chile changed everything for me. Friendships are good. They give your life so much meaning. I know that for some people, I felt far closer to them than they did to me. They meant more to me than I did to them. I know that. But it’s okay. That was my first time having real, true friendships. I am forever grateful for that, and they will always be special to me for that. Human connections cannot be forced. They happen when it is time. The people who are meant to be in your life will come into it on their own time, and they will not need to be begged to stay in it. They will stay with you through all of the joy and all of the sorrow, and they will remain even when you are physically separated. Those friendships may wane a little, but just like the moon, they will always be there. Chile helped me to grow immensely. Chile made me a better person. I will never forget my time in Chile. I will never forget the people who helped me to become the person I am now. I will never forget the place that taught me how to be a better scientist, photographer, and human being. Chile, te amo mucho. A few years ago someone told me that there was a fish market nearby that also hosted a cohort of sea lions that stuck around because of the proximity of said fish market. I wanted to go. I meant to go. For various reasons, I never did. Years passed, and I still kept coming to Chile and never went. A few weeks ago, I took my first venture alone to the nearby city, San Antonio, out of necessity. I got on the microbus, paid the upmost attention to where I was headed, made my way to my destination as quickly as possible, and got out. 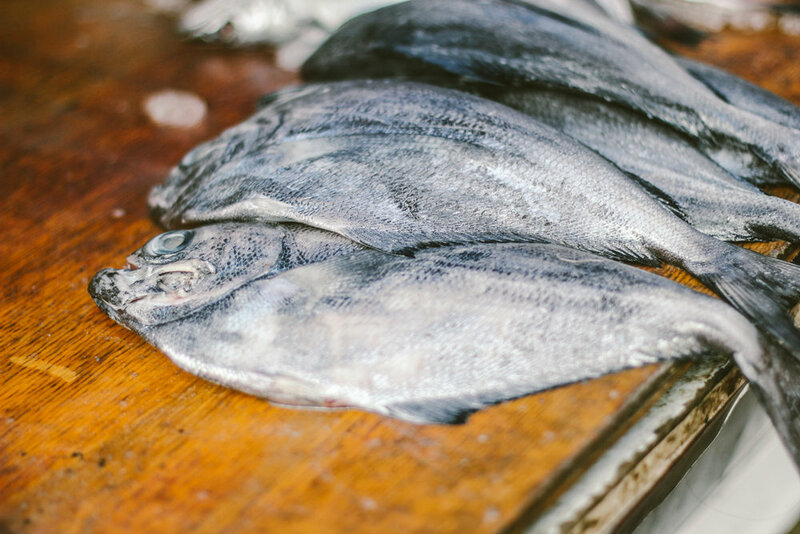 But, after having successfully made my way to the port city by myself, I felt the courage to finally head out on my own and visit that fish market I had heard so much about. I have recently become infatuated with photographs that are incredibly intimate. This may seem a bit bizarre in the context of the fish market, but allow me to elaborate. I wanted to capture the rawness of it. I wanted it to be fully exposed, I wanted to show the intricacy of this way of life that is so important to so many people. I wanted to show daily life in a way that made it beautiful. Armed with my film and digital camera, I got myself up early on a Sunday, trekked to the bus stop, and watched the coastal towns unfold around me as the micro carried me to my destination. I was a bit nervous as fisherman’s Spanish is notorious for being difficult, and I wanted to make sure that I understood them when I politely asked if I could photograph their seafood spread. But, I was deeply determined to get these shots and to see everything (especially the sea lions), so I put on my most confident persona and made my way to the fish market. It was more than worth it. The sea lions were there, in all their magnificence, huge and breathing and alive in front of me. I had never been so close to one, or really even seen one outside of an aquarium. The fish market was fascinating, and I understood and was able to communicate with the fisherman, all of whom were very kind. This was one of my favorite photograph series in Chile to date (all photographs below are digital, the analog ones are coming soon!). I developed a lot of confidence that day. As wonderful as it was, though, it took me a long time to get to that point. It took me a long time to just hop on the micro and go for a day by myself. It took a long time for me to feel confident enough to speak with fishermen. I feel far more confident with my Spanish now than I did a long time ago, but I know I have a long way to go. I resent that people still make snarky comments about my Spanish, or that people act like I still don’t understand what is being spoken. I understand most of what is said to me, I understand most of what I read, and I can even watch movies and television in Spanish and I understand it. It took a long time to get there. It took a lot of work. It took a lot of listening, a lot of mistakes, a lot of people making fun of me and a lot of pulling myself back up to get where I am now. But, I did it. It took a lot of overcoming my anxiety to get on that micro and go to a city alone. But, I did it, and for that, I am so proud of myself. To many, traveling to San Antonio alone was nothing special. “Ni un brillo” as they say. “You’re an adult, that’s just a regular thing adults have to do. Not really a thing to be excited about.” And in truth, for people who live here or who have been here for a long time, it is nothing. It is a breeze. It is easy and an adult thing to do. But for someone who isn’t from here, who is terrified of change and has difficulty in new or unfamiliar things, this was a mountain. 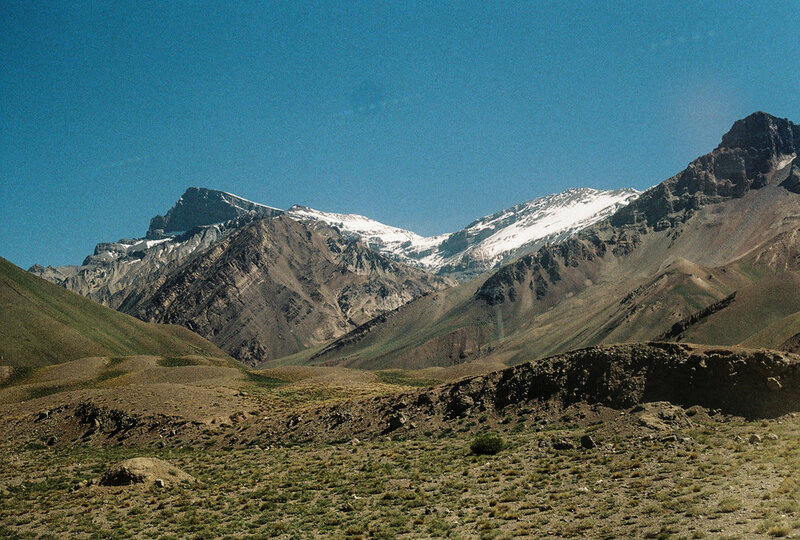 Their anthill was my Andes, and it took a long time to for me to get there. Sometimes you have to shrug off what other people tell you, view yourself and your situation from your own point of view based on your previous circumstances and realize that you did something good. Sometimes you have to give yourself some credit and realize how far you’ve come. Walking five meters ahead may look like nothing, but it is five meters further than you were. Growth is still growth. Celebrate the little victories, even if no one else sees them for what they are. And as for me, I would say that this is more than just a little victory. It was a big win in my book. I have wanted to shoot film for as long as I can remember. After years and years of wanting to do it, I decided I was done saying that I wanted to do it and it was time to actually invest in a film camera. 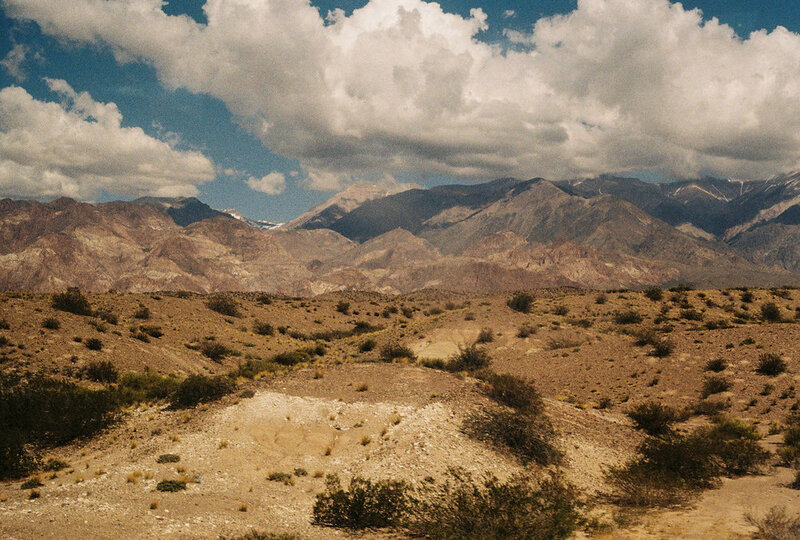 I bought the Canon A-1 as a graduation present to myself in May 2018 and decided to teach myself film while in Chile. Over the past few months I have shot four rolls of film, one using a Canon SureShot 75mm point and shoot with Kodak Gold 200 (the last two images under “Las Cruces”) and three using a Canon A-1 SLR (Two of which were shot with Kodak Portra 400 and one with Kodak ColorPlus 200). I am absolutely enamored by film and have grown to love it more and more as I continue shooting. The colors that you can achieve and the focus are what drew me into film in the first place, and I love how well the photographs have turned out. There is always that sense of anxiousness when you send your film off to get developed because you are never sure what you will get back, but seeing those photographs for the first time is one of the most exciting and fulfilling feelings. Below is some of the work I have done over the past few months sorted by location. As a little girl, I remember hearing about Easter Island. We had lessons about the island in school. I read about it in books. I saw it in documentaries. I was taught about the Moais and about how remote the island was, and I always thought of it as some far off place that few people could access. I never imagined that many years later I would be one of those few people. An opportunity to travel with my laboratory for a two and a half week research trip to Easter Island (or Rapa Nui as it called by its native people) allowed me to get on a plane and travel 5 hours from the mainland of Chile to one of the most isolated places in the world. I was standing on a green speck in a sea of blue for thousands of kilometers, and I never truly understood just how isolated we were. It never felt real to me and it never will. The first day we arrived, we headed to the dive shop to make arrangements and unload some of the equipment. I immediately noticed that the dock was directly accessible from the shop and eventually I decided to drop everything and go see the very thing I had been hoping to see for so long. Over the past few months I had been painting organisms from Rapa Nui for a book that my laboratory is producing, and after having looked at those organisms through a computer screen for months and pouring everything into those paintings, I had to see if I could catch a glimpse just from the pier. Fighting my instinct to work all the time, I stole away from the group with my favorite burnt orange skirt rustling in the wind and found my way to the water’s edge. What I saw brought me to tears. A group of porcupine fish, a species I had only see in books, swam haphazardly in between the boats. There they were in their natural habitat, in a place I had only dreamed about seeing for so long. I dreamed of tropical waters as a child, but they seemed unreachable. Now, here they were. And then, suddenly, a beautiful green sea turtle arose from underneath a boat. In all her splendor, she arose from her hiding space to breathe. She was beautiful, with dark eyes and with patterns on her shell that looked as if they were painted. In that moment, nothing felt real. I couldn’t believe what I was seeing. As I was admiring the turtle, a school of one of the most common species on the island (“tipi tipi ‘uri” or “Easter Island Butterfly fish”) swam past. Something I had painted and spent so much time studying was real. They were there, moving and breathing. Two days later, I had the opportunity to immerse myself in the clearest waters I will ever see and I saw my first coral reef. I had heard about coral reefs all my life, and here they were right in front of me. I maintained my buoyancy and floated above them, admiring their delicate beauty from a distance. The current pulsated like breathing and I felt it. I was a part of this world, I was studying it and pulling it into myself as I tried to understand it. I came up from that dive in a bit of shock and it took me a long time to process what I had seen, and it left me starving for more opportunities to experience this foreign place. I cannot detail everything I experienced in Rapa Nui. However, I will try to relay some of the most meaningful and beautiful things that I experienced during my time on the island. There were roughly two places on the island that I knew I had to see while I was there, one of which being the tide pools. 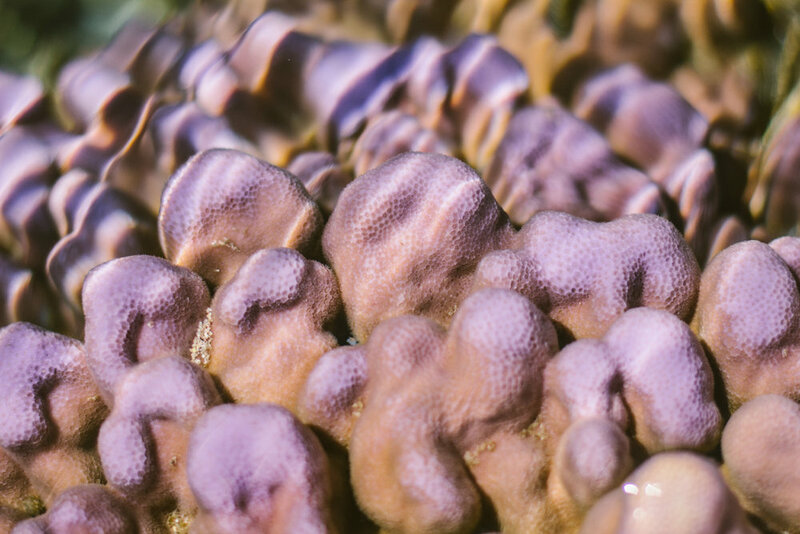 There were tide pools just outside of Hanga Roa that had corals, and after seeing photographs of them on our laboratory’s hard drives I knew I had to see them. I almost didn’t. There was a possibility that we would go one day, but plans started fading and it appeared as though I would have to unfortunately miss out on seeing them. I tried not to think about it and continued with my work until it was decided that we would go after all. I sat in the truck in anticipation as I watched the wild coastline unfold in front of me. The town of Hanga Roa disappeared and turned into tall golden-green hills. Towering cliff sides hovered over the coastline as if to guard it from outside forces. We pulled in to our destination, climbed down from our lofty truck, and descended into the coastline. The craggy black lava rocks jutted out from the ground in contorted patterns that only became more bizarre as we traversed over the strange world. And then, there they were. Glimmering in the sun, the pools featured a dazzling array of corals of various colors that beamed radiantly through the turquoise waters. I have never seen colors blend together so beautifully. The breeze rippled over the surface and made the colors blend even further as if it the pools were a prism. It simply took my breath away. 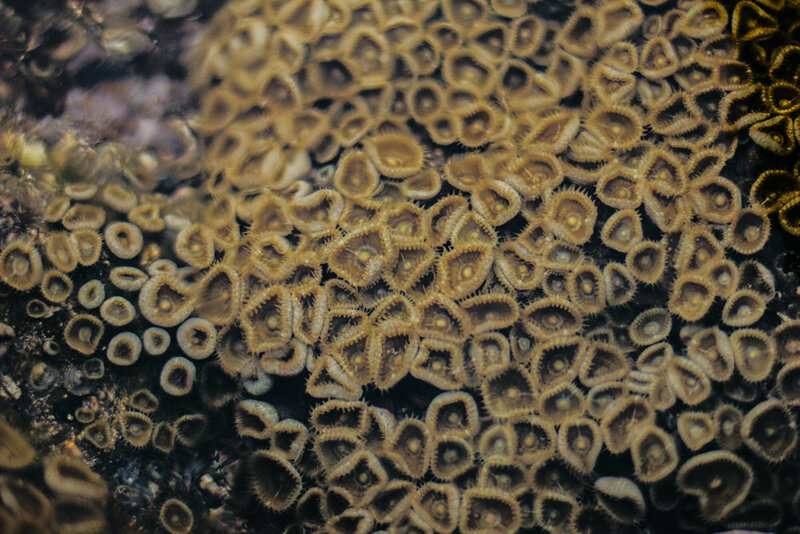 The species of corals in this pool (Porites lobata) may only grow up to 1 cm per year, so I can imagine that these beautiful structures were quite old. So much strength and patience over so many years. One of the pools was particularly large and held a spectacular assortment of gorgeous corals with a smaller pool adjacent to it that held several species of fishes. I photographed the porcupine fish that I had seen the first day I arrived and the photo looked as if I had taken it from under the water. I watched in awe as the fish swam so close to us and as the corals’ vibrant colors radiated from the bottom of the pool. I tried and failed to truly capture the beauty of this place. It was unfathomable just how beautiful it was, and it was truly one of the most beautiful places I have ever seen in my life. I have never seen waters like I did in Rapa Nui. I’m not sure I ever will again. The water is like glass and completely transparent due to the lack of nutrients present in the water column. You can see the seafloor below you from the boat. I saw some of the bluest blues I have ever seen. As the sun illuminated the water, an immediate change in color rushed over waters around the boat and vibrant blue enveloped us. My cheeks hurt from smiling. I glided over fields of corals. I traversed over rippling sandy sea floors that merged black and white sand together in beautiful swirling patterns. I saw fish I had only ever imagined seeing, and I saw the animals I had painted come to life right in front of me. There were few moments that were truly as profound for me as seeing those creatures I had worked so hard to paint accurately move and breathe in front of me. They truly existed and did not only live in publications or in books. In one moment I was running transects and I turned behind me to see a scene that looked straight out of the documentaries that had breathed life into me as a child. A congregation of rocks coated in algae and a few corals and surrounded by various species of fish was illuminated by shimmering light from the sun, exactly in the way that you see it in photographs or documentaries. I paused in awe. I felt like I no longer existed, I was simply within a space that was glorious for the sake of being glorious. In the same dive, I was swimming from one location to another and spotted a cornetfish moving in my direction. We were going opposite ways but crossing paths, and something about this fish drew me in. As we came closer to one another I slowed my breathing so as not to scare the fish with my bubbles and I admired his slender silver body. We had a moment where we both were looking directly into the other’s eyes and I cannot tell you how profound that moment was. I am careful not to anthropomorphize animals as a biologist because it can be a dangerous method of thinking in terms of adding bias to our perception of their behavior. However, these animals know that you are there. They acknowledge your presence. They see you and size you up. We looked at each other, acknowledged each other, and studied each other, and then we went on our own ways. I live for those intimate connections with animals and those moments that remind me that I am studying creatures that are vividly alive. There was one dive that was particularly important for me. When I first began diving, there was one thing that had always scared me: dropoffs. Anywhere that dropped off to the bottom of the ocean floor or where the bottom was hundreds or thousands of feet down freaked me out. That idea of all that space between me and the bottom and that “void” as my Oceanography professor called it truly made me nervous. However, like many other instances in my diving career, I knew that I had to do it. Once I do something at least once, it no longer scares me. That happened with me the first time I went to 60 ft/18 meters, and the first time I rode the bus alone in Chile. It was something I had to overcome. The year before, I had also come across a photograph of Motu Kao Kao, a rock face that juts out of the ocean. I saw that and remembered thinking, “I have to see that one day.” I was secretly hoping that the opportunity would arise for me to go. It did not appear likely, especially since the group could tell that I was a bit nervous about it. I had actually thought the situation through enough to make myself not nervous, but their nervousness made me nervous again and I felt a lot of negative pressure. But, I had an absolutely wonderful dive buddy, and together she and I descended into a world I never thought I would see. 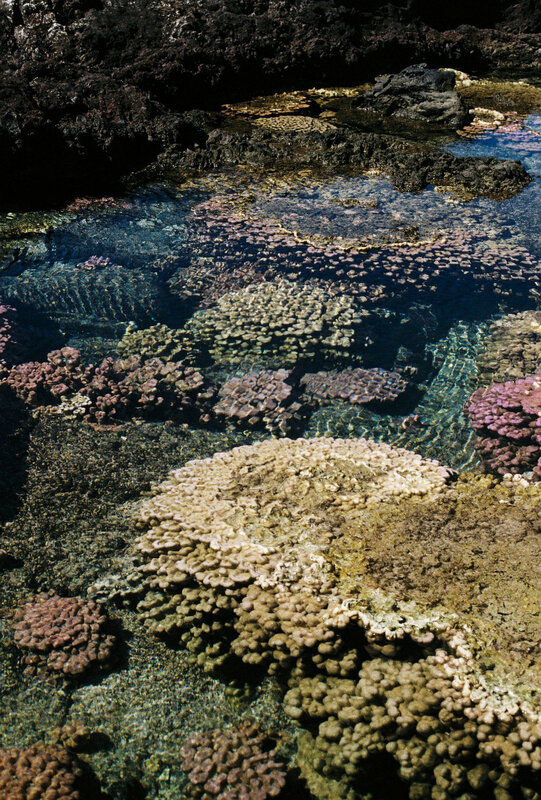 Among the bluest of waters, corals lined the walls of the rocks and life abounded. Fish species I had not seen previously appeared out of seemingly nowhere. I saw my first school of fish in the distance. The massive congregation hung weightless together in complete tranquility. Everything was so close and yet so far away but it felt like none of it was truly real. I ran through my air faster than I would have liked due to me fussing with my buoyancy and the subconscious nervousness, but I arose from that dive with the biggest smile on my face. Sadly, I took very few photographs during my dives. When I was able to dive, I was working, and my camera housing was in use for other scientific work. However, I did receive the opportunity to photograph at another time. The pier offered the opportunity to snorkel the shallow waters of the coast and observe an abundance of species without having to swim out a great distance. “La Caleta” as it was called hosted a variety of green sea turtles that sought shelter in the calm waters near the boats. I had been eyeing the sight for days as a snorkeling destination but never had the time to go since there was work to be done. One day, however, I decided to take matters into my own hands. I only had so much longer in this gorgeous place and had few underwater photographs to show for it and little time spent observing these animals I adored so deeply. Fighting everything in me, I put my work aside for a moment and tore off into the sea. You cannot keep me from the sea. I will find ways to explore it, even if I am blocked at every turn. Normally I never snorkel alone as it is a dangerous practice because you never know if something could happen, however the cove is directly next to all of the shops and everyone can see you. Plus, there were often other swimmers and divers. I eased myself into the warm water and swam out to meet the wildlife. What I saw astounded me. There were so many fish, more than I had ever seen in one place at a time in my entire life. Everywhere I turned there was life. The various species of fish were foraging around the algae-covered rocks. A gorgeous turtle swam past me, and I floated beside him. I was shocked to find that he was not disturbed by my presence and he swam gently around me, allowing me to watch him and hover above and below him as I admired his quiet dignity. There was an unspoken sense of trust between us. A moment like that will change you. A moment like that will give you life. The life that had been slowly draining away from me over the past few months was refueled in those moments under the water by myself. It was me and the world I loved. I finally felt like I was a part of something that had driven my every decision for the past 12 years of my life. On the last full day before I left, I did all of my assigned tasks, assisted the team with the equipment, and then I again tore off to the sea. I stayed in the water for as long as I could stand it, until I was too cold to go on. As I reluctantly finished my dive, I sat on the steps in my full wetsuit, breathing and watching the small waves pull and pull themselves along the small rocks. I knew this was the end. I knew I may never see this again. I knew I was terminating my last opportunity. But I was so happy, and I don’t think I have ever been that happy. I sat there in that moment, reveling in it as the water dripped down my hair, off my wetsuit, and onto the warm concrete. Few places have moved me as deeply as Ana Kai Tangata. 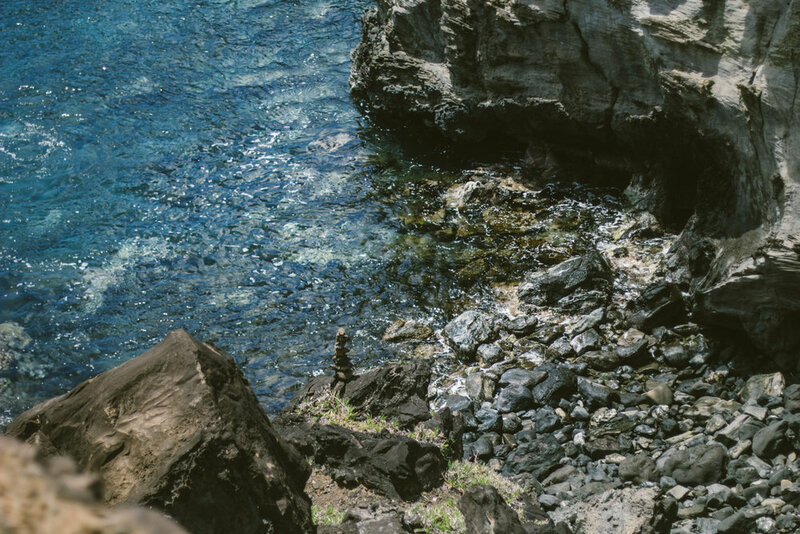 Situated just outside of Hanga Roa, Ana Kai Tangata hangs over a turquoise blue waters with boulders scattered throughout the water that look like mosaic patterns. The cliff faces are extravagant, with one that has gorgeous deep black lava rock and another one that has cream-colored rock mixed with deep browns and whites. 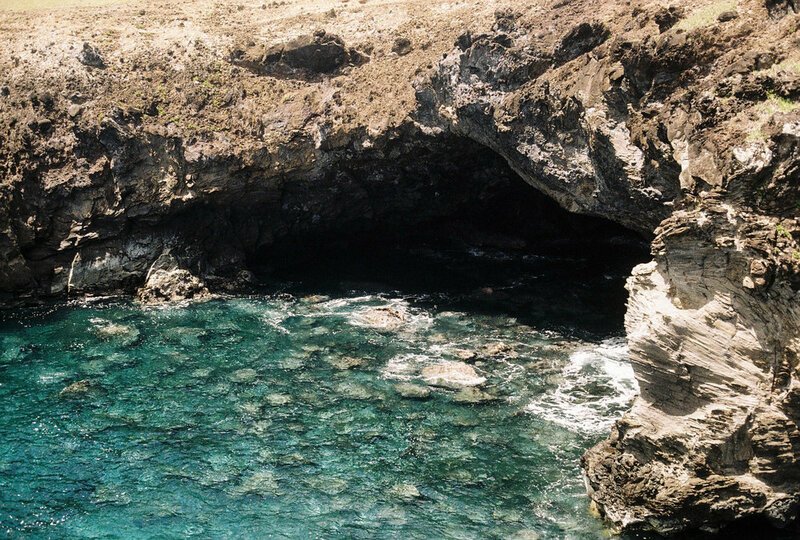 In the distance, the towering cliffside of Mataveri overlooks the open ocean. There are also several caves, one of which that has a petroglyph that is hundreds of years old. I have never seen a place as beautiful as as this one. I was in awe at the crystal waters and incredible rock structures. I still think about this place a lot, and I will for a long time. My photographs are not nearly the same as being there, but I hope that they relay just some of what I saw while I was there. Rapa Nui is unlike anywhere else I have ever seen. It is wild, vibrant place and is more than just the Moais. I wish I could kneel down next to little me and whisper in her ear, “One day, you’ll see those places they taught you in school. 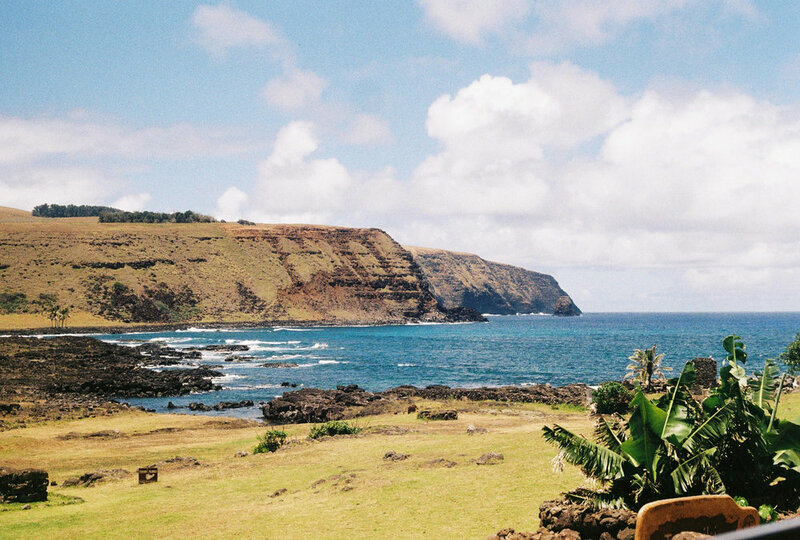 That island will make you a better person.” I am still in disbelief that I went. There is still so much to relay. But for now, I will leave you with a few more photographs. 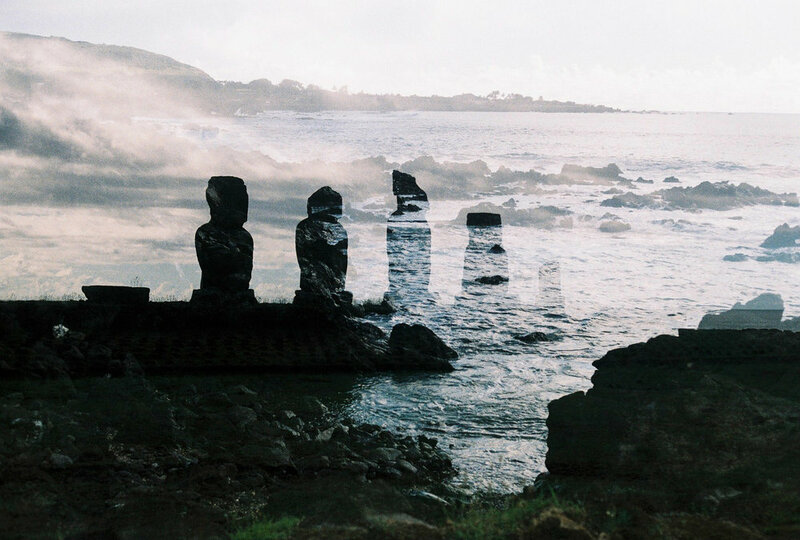 I have always been enamored by double exposure photographs. I have always been equally enamored by film photography. After years of yearning to accomplish both, I finally had the opportunity to do both. Before returning to Chile this year, I bought myself a graduation present in the form of a beautiful Canon A-1 and vowed to teach myself how to use it. I’m only three rolls in and already obsessed. 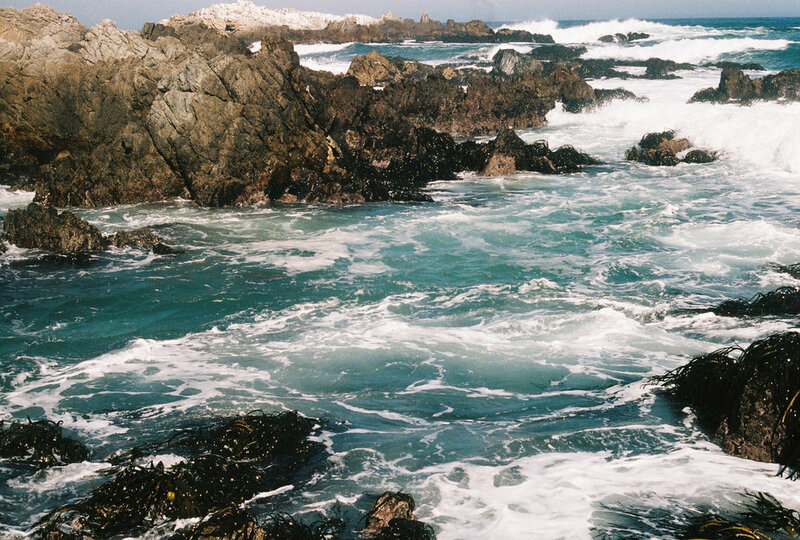 Film has a look unlike any other medium: the colors and focus are so dreamy and beautiful. There is something truly special about using something from so many years ago to create new art, and there is truly nothing like seeing your photographs for the first time after they are developed. I recently received a generous grant from Two Photon art to perform a project I had been toying around with for a long time. 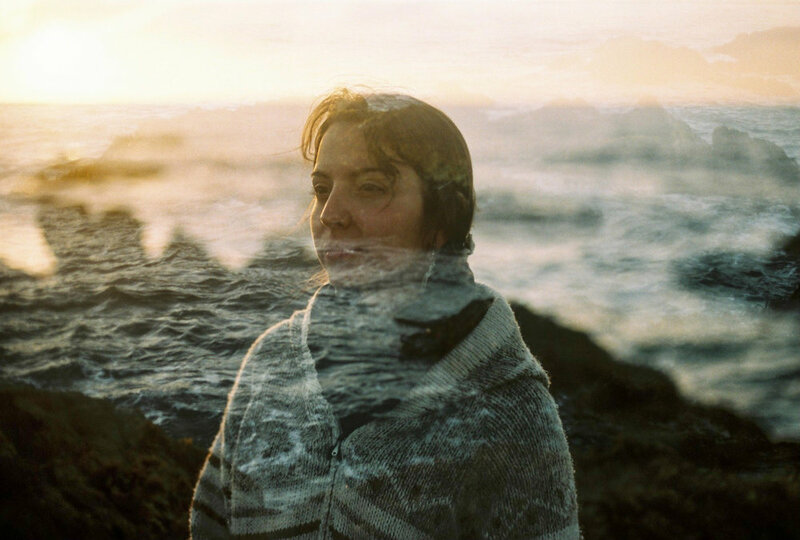 I wanted to combine my love of film and double exposures with my love of marine biology and the people who work at the marine station where I am currently located. The project seeks to personify the people who work with the sea while visually connecting them with it. As marine biologists, we are so intimately connected to the ocean that we study and it becomes a part of us. However, the people who perform important work in marine biology are often overlooked or neglected, and I wanted to showcase these dedicated individuals. Below are portraits of the individuals who work with the sea here in Chile. They appear in the same order in which they were taken. Thoughts and musings from the girl behind the lens.